Just a friendly reminder that our Gallery Tunic + Dress sew-along will be all next week. You can purchase your Gallery sewing pattern in paper or digitally, whichever you prefer. 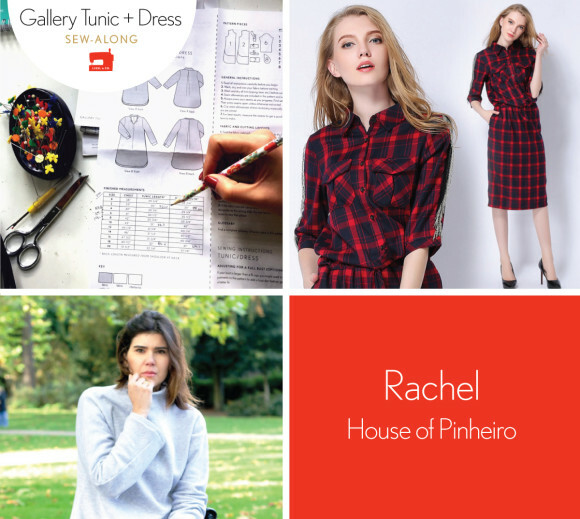 Today I’m delighted to bring you your sewing gal-pal Rachel. She is also joining our talented panel. Rachel hosts these really fun daily photo challenges for sewists called #sewphotohop on Instagram. She’s hosted them in August and December. Look out for one in the future, play along, and meet others who share your passion. What has Rachel got in store for her Gallery garment? Read on to find out. A little bit about me: Brazilian born, tea drinker, sewing fanatic, colour lover…. oh who else finds it hard to describe themselves? I will let my projects talk about me…. You will find me at ‘House of Pinheiro’ where I share insights of my creative journey, seasoned with a few glimpses of my personal life. I consider myself a sewing fanatic and having the opportunity to travel the UK (and abroad) to meet other ‘sewing people’ with the same passion and interests is one of my favourite perks of our hobby. I have a fabric stash that has outgrown my life expectancy and no willpower to stop adding to it. I’m really excited to be a panelist for the Gallery Tunic sew-along and be sewing along yourselves. Today I’m about to reveal my sewing plan. I adore shirt-dresses and how easy and comfortable they are to wear. So…. One decision down: I’m making the gallery tunic view B. One thing about being an hourglass shape and very tall is that I need some bust-waist-hip definition to make the most of my figure. I will be adding either a fabric belt or elastic casing to achieve that. Since I like my clothes not to be too relaxed at the shoulders I will make sure to sew a test garment as I have the impression I will need an FBA to get the fit I love. You cannot imagine how excited I was when I saw that an FBA instructions were included on the patterns. YEAH! I’m currently exploring new hemlines and loving the ladylike just over the knees, but to keep it young I will add a side slip at both sides. I got the perfect representation image of my plans. Now do I dig my bulging fabric stash or should I naughty go looking for something in plaid? Big Decisions….. I think this look will take my winter wardrobe nicely into spring. I have a question. This will be my first sewalong. Should I have my pattern all cut out and ready to see? Ready to sew!!! Darn autocorrect!!! Lynn, that would be a good idea. Both of them–having the pattern ready to see and to sew! Hi, This is also my first sew-along – is there any other background info to help newbies understand how these work?